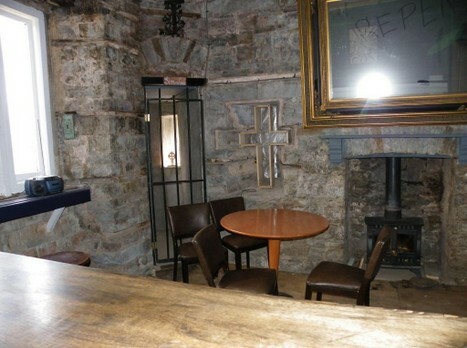 New at Craig y Nos Castle - the Haunted Cross Room Bar! Now your Ghost Tour need not stop when the tour is over. After your tour retire to your own Haunted Bar. This stays open as late as you want. Your host is Steve, our resident paranormal investigator. Here Steve will top you up with warming spirits as you gather around the old wood-burning stove, regaling you and your party with ghost stories past and present. 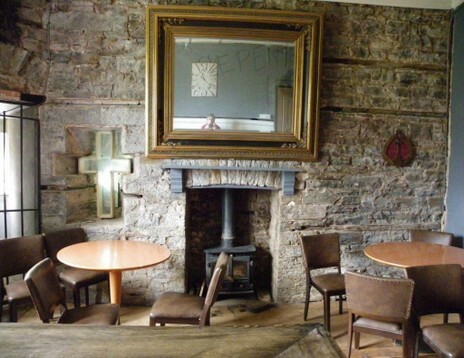 You won't want to leave alone, for this bar is located in the heart of the haunted upper floors of this old Castle. The Haunted Bar is on the first floor of this old Castle, in the Derelict Area. If you are organising a group you may use this bar exclusively for your party. If you are on a Share the Experience Tour please let the ghost company know in advance, if you would like to use the Haunted Bar at the end of your tour. 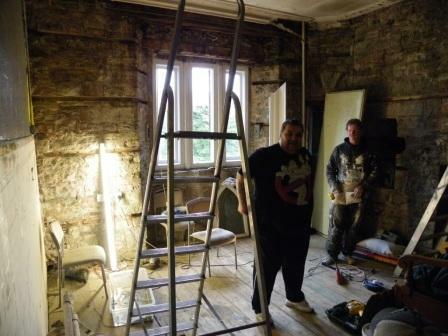 See the rapid conversion of one of our derelict rooms, the Cross Room (you can make out the cross in the pic on right, to right of second man standing), into the 'Haunted Bar' below. 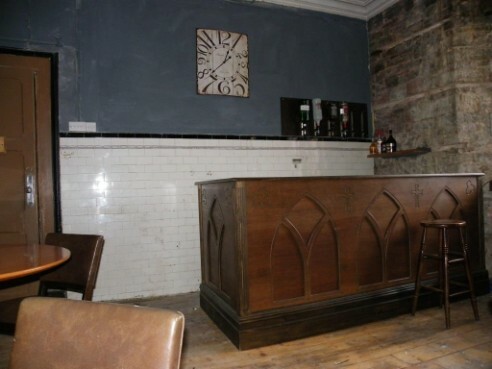 IS THE HAUNTED BAR HAUNTED? 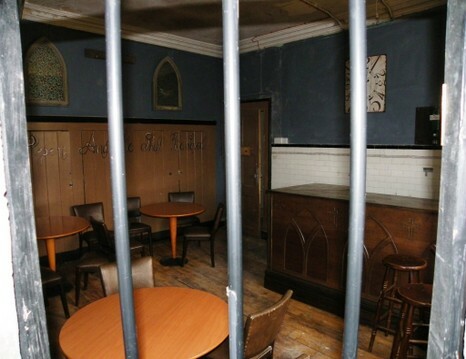 For evidence the Haunted Bar may actually BE haunted, go to our Blog on the 'Haunted Bar' and check out the story and the camera shots of a chair moving from a table to in front of the door, as if to block the person in the bar from getting out. Follow the link through to You Tube to see the video. For exclusive use of Fright Nights, Hen Parties and by special arrangement (at the end of the tour) Share The Experience Ghost Tours and All Night Investigation Ghost Tours. 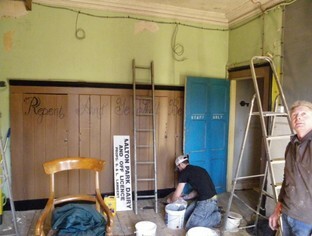 Conversion: Early Preparation in April 2013. Old Floor Boards Sanded. First Fix Electrics. Cupboard Doors painted Brown. Windows cleaned. 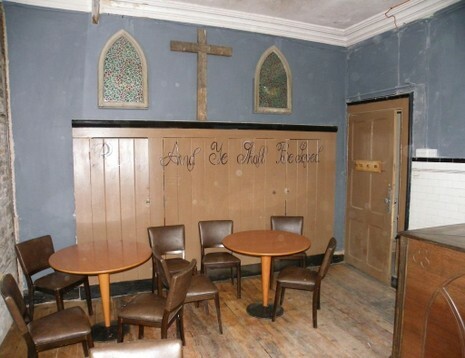 Sign-writing on doors, "Repent...." Bespoke Gothic Bar created by a carpenter in Port Talbot and collected. All hands on deck in the last week to get the Haunted Bar ready for the first Fright Night that will use it Saturday 27th April. 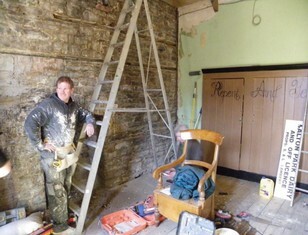 Castle Builder Mike applies rough grey plaster to old crumbling walls (3rd pic below). These old walls were last plastered when the Castle was a TB Hospital in the 1920's. Steve Graham of the Paranormal World finishes painting of windows (1st pic below), and applies stained glass screening to windows. 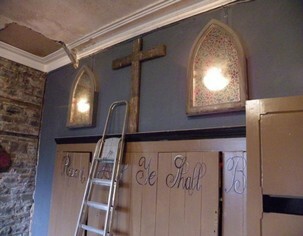 An inner wall is prepared for two back-lit gothic style old windows (middle pic). 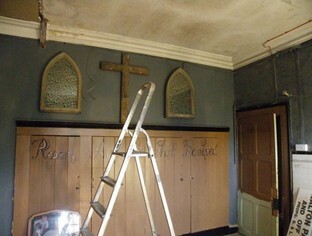 Below left, the stained glass windows are hung on the wall, ready to be back-lit. The cross is hung - in keeping with the gothic church theme. Door is half painted and being repaired with new handle and lock. 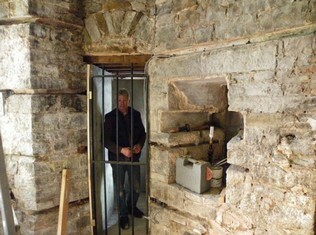 Middle picture, Anthony fits the cell door to the turret room. Fright Night guests who are naughty may find themselves in the cell! 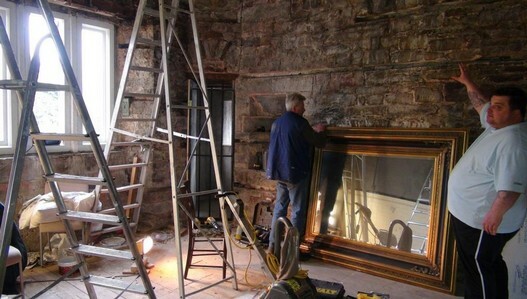 Right picture: we find a very large very ornate mirror stored in derelict State Room One - "that will come in handy in the bar", Steve declares. 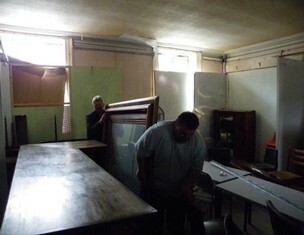 Below left, Steve and Anthony carry the huge mirror along the corridors of the derelict first floor. 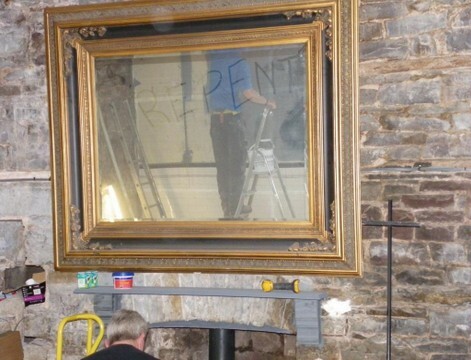 Right pic: Steve plans with Anthony where the mirror should be hung (above the fireplace). Left pic below - mirror is hung. 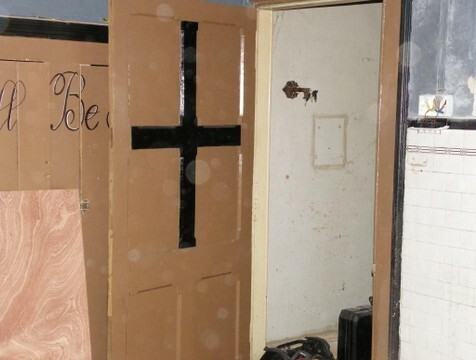 right pic, entrance door now painted, with cross. Left pic below, Mike Builder repaints wall second time after the plaster fell off the first time due to problems with wall surface. 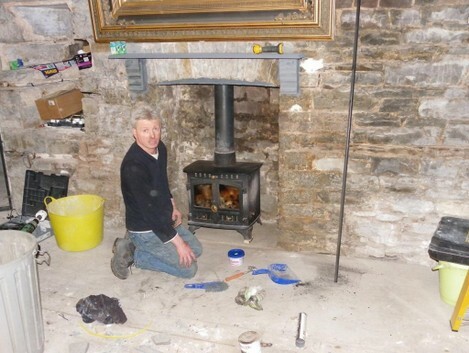 Right pic, Builder Anthony installs stove. This is lit for the first time to check chimney, not used in probably 60 years, works fine - and it does. 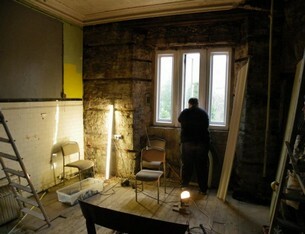 Electricians second fix, left pic, to Gaol turret light, and second fix to back-lit windows, middle pic. Right pic below shows back-lit windows fully connected. 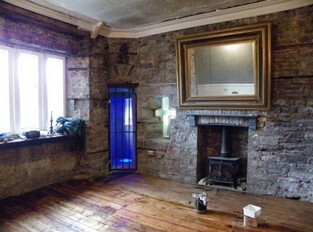 Left pic shows Gaol Turret illuminated in blue and the back-lit cross. Right pic shows red illuminations. Middle Pic shows Steve fascinated by the colour changes; after a half hour of careful study he tells me the colour sequence from memory! 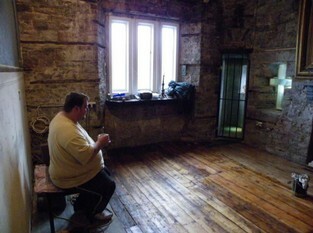 I meanwhile was staining the floor which Steve and Team had sanded earlier in the day. 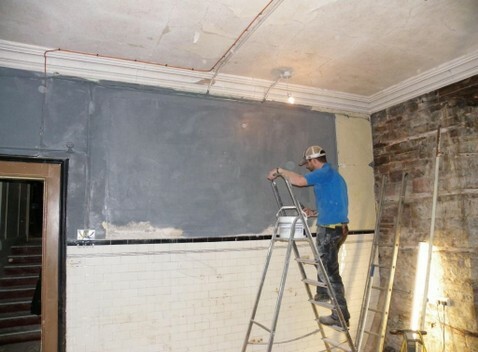 It will be wax polished on Day Five, when the bar also goes in and is stocked. 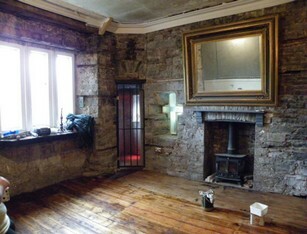 Haunted Bar installed (left) and seating area by fire and gaol (right). 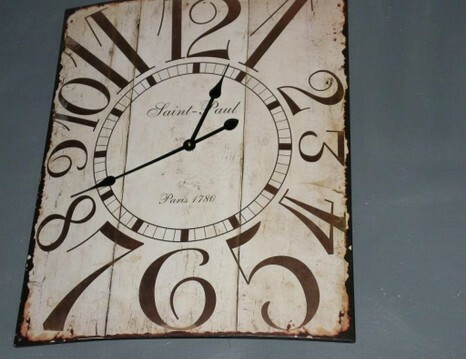 See the optics in place to right of Clock, so our Spirits are already present in the bar. Haunted Bar seats 12 at round tables, plus others on bar stools. 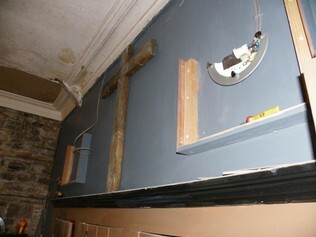 The Haunted Bar is now complete and was inaugurated by the next Fright Night on Saturday 28th April. Haunted Bar view from the gaol (left) and the clock wiith typical end of Fright Night tour haunted bar opening time displayed.